The wind whips around us on the top of Croagh Patrick and we can’t see anything below because of the clouds and the fog. Every so often, the grey clears to real a spot of blue sky above Westport’s blue harbor dotted with islands. The wind moves the clouds so fast we don’t even have time to get our cameras out. Rain sounds like hail as it gently hits the ground and our sturdy raincoats. Soft grass covers a small patch on the side of the mountain in front of our rocky seats, but below we see rocks, rocks, and more rocks. 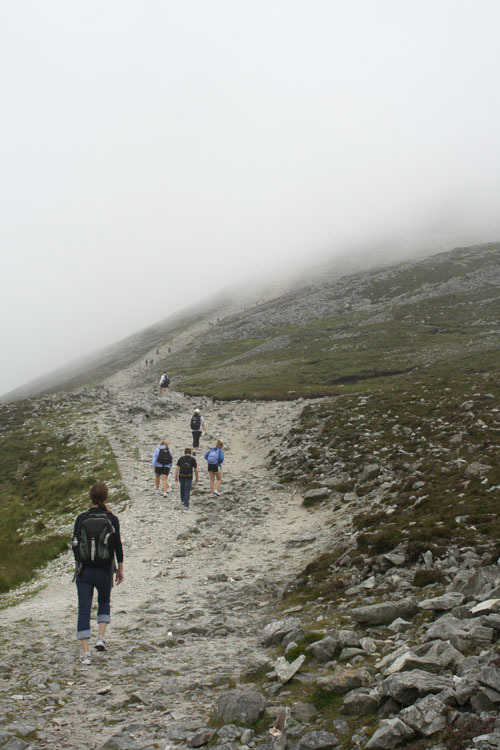 No one had known what to expect when we eagerly decided to climb this mountain in County Mayo, the site where St. Patrick spent 40 days and 40 nights with blackbirds and snakes. I had read a bit about how rocky it was and that pilgrims should rent a wooden walking stick to sturdy themselves during the climb. But besides that, we thought we were ready for anything. We were in for a surprise. “That’s nothing more than a pompous hill,” Matt had said with disdain as our small bus wound toward the mountain. All of us looked at him in disgust while contemplating the beast ahead. He soon realized that what he thought was Croagh Patrick was actually a hill blocking the real mountain. “That’s sick!” he finally said upon seeing the rocky summit ahead. We started off with a group picture at the base, and jackets stowed in our packs, began the climb. Steps led up the side of the hill beside the ominous white St. Patrick statue and soon melded into a rocky path. They were small rocks here, mixed with water flowing down the side of the mountain. Finding the best way to get up already proved difficult as the path varied from loose gravel to wobbly shoe-sized rocks to even larger ones that were luckily secure in the ground. Even 10 minutes up, the group had already split, and I trudged along in the back. My chronic cold combined with the steepness of the climb were already getting the best of me; many people later said they thought I wouldn’t make it because of my tomato red face and heavy breathing, but I knew that I would make it. I had to. An hour up, the path leveled onto what was called the shoulder of the mountain. We passed a grassy clearing below where climbers had spelled out words with rocks: KISS, AMORE, KUTKEY’10. From our height, they looked like small white pebbles, but I’m sure each stone was much larger. Finally, halfway meant it was time for a break. While sitting on top of more rocks along the path, the fog enveloped the mountain. One moment I could clearly see the harbor below, but the next we couldn’t even see the side of the mountain. The gray moved around us, threatening rain to end our journey, but somehow the skies knew they should hold off for us. Sheets of fog — or clouds? — hid the trek above. Further and further we climbed, balancing our feet on the precarious rocks, hoping to not slip. There it was: the base of the final ascent loomed before us. The rocks just kept going up, looking unsteady as climbers ahead attempted to go up. Rocks jutted out from the brown dirt beside us, giving a slight handhold to pull ourselves up. Carefully and slowly I continued up. Taking short breaks to look back at the unknown grey behind and the neverending rocks ahead, I watched other climbers pass me in both directions. Down came two dogs — did they make it all the way to the top? — and a woman who has climbed 14 times. Her wooden walking stick keeps track of the dates of each conquest. A man in too-short shorts sped up past me, barely glancing down at the rocks slipping under his feet. “Just around the bend and then up,” one man told me as I huffed and puffed. “Fifteen more minutes!” another woman said. I made it. 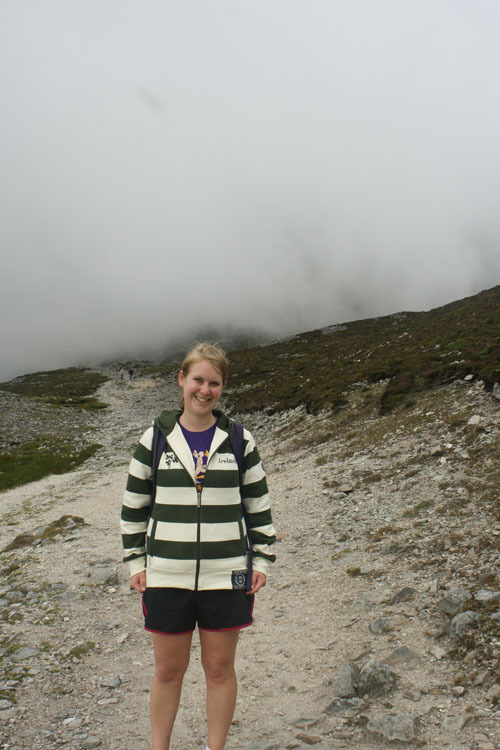 We survive the climb of Croagh Patrick. It isn’t a spiritual pilgrimage like it is for many, especially on Reek Sunday, but it is an individual journey for each of us. A time for reflection, ambition, achievement. With congratulations to each climber, we give our weary feet a much-needed rest. But just for five minutes until the rains come, cutting short our refueling and journaling, spurring us to make the climb back down. The rocks slide beneath us, and at one point it’s like surfing as I skid down behind a couple with walking sticks. That’s enough uneasiness for me though; I’d rather descend with deliberation and concentrate on each step. It takes time, but slowly, and after only three falls, I’m back at the shoulder. Familiar sights seem new from this opposite direction. Jellied legs are unsure if they can make it farther, but then we see the parking lot, the last stretch of the walk, the St. Patrick statue. And yes, I bought the T-shirt.